Described by the Sundance Film Festival as, “a meditation on isolation and intersection in the big city,” Alfredo de Villa‘s “Adrift in Manhattan” is the director’s second feature, following the acclaimed 2002 film “Washington Heights.” De Villa’s debut feature received a special mention at the first Tribeca Film Festival in 2002 and the movie was distributed by MAC Releasing. His new film, starring Heather Graham, Dominic Chianse, Elizabeth Pena and Victor Rasuk, looks at three characters who experience change after encounters with strangers and was co-written by de Vila and Nat Moss. Please tell us about yourself… Age. Day job (if you have one) and former jobs. Where you were born? Where you grew up? Where you live? Day Job and Former Jobs: In the last year I have been extremely lucky to make a living from directing (features and TV commercials). However, I have run the gamut in all the types of jobs I had in the past. They have ranged anywhere from dishwasher, chef, waiter, translator (for the Research arm at the Columbia Presbyterian Hospital specializing in Sexual Deviances), proofreader, Advertising Producer, sound grunt, etc., etc. Birth & other stuff: I was born and grew up in Puebla, Mexico. If you knew about Puebla, you’d understand a lot about me. So I’d just leave it for the connoisseurs. I didn’t come into the US until I was 17. I have been here ever since, but always traveling back to my hometown every chance I get. I’ll be from Puebla until they bury me. Film School: Columbia University, a Masters in Directing (not that it helped that much!). I learned about film since I was 7. I just keep learning along the way. Oh, boy. This is one of those questions that can easy lead to a very long answer. I was conscious of becoming a filmmaker when I was 7. I had seen one film that moved me to tears. Everything the movie was about was immediately present in my life. The problem, of course, is that, unlike the characters in the film, I couldn’t just blurt out my feelings toward my mother. I had to keep it all in. For the first time, I realized that those deep and long silences contained more powerful things and evoked even stronger emotions than anything that was said outright. From the time I understood–what came to me–this powerful feeling, I grew to love film. I had no idea how one got to make them, or how they even got made. I could care less. All I knew was that I had to make them to explore the unspoken feeling, the long and deep silences that lie between people. What other creative outlets do you explore (music/painting/writing etc.)? How did you finance your own film? Here, most like other filmmakers, I tend to tell funny stories. But the real answer was that the road to financing the film was difficult and long. A lot of folks who have companies said no. They actually spend time to discourage me from doing the picture. Once my producer, Steve Brown, got on board, the road became a lot easier. As long as we made it under certain restrictions, we got a chance to make the movie. Please tell us about your film, and how did the initial idea come about? The initial idea for “Adrift in Manhattan” came to me in an airplane to Havana, Cuba. I was heading to the last festival that year (Havana takes place in December) with my first feature, “Washington Heights.” I had a very good festival run that year and I had–as luck would have it–traveled all over the world with the film. While I was naturally thrilled and excited, I was also exhausted. I realized–at least, based on my personal experience–that while we have all of these technological advances that takes us from the most recondite to the most elegant cities in the world, we’re essentially left emotionally (not to say spiritually) at bay. We don’t necessarily change or become enlightened with every journey we undertake. I was born in Puebla, Mexico, and here I was heading to Havana, Cuba, a place that existed only in my imagination; I never thought I’d be doing so much traveling. The sense of immediate direction strikingly contrasted with the emotional isolation. I thought of exploring this basic idea within three characters. Why three? I’m not sure. That number has always contained something balanced and just right. So I settled on the number while I was sitting in the plane (by that time, we had already landed and we were waiting to taxi–it took over 2 hours). The other idea that came to me was exploring this sense of tiredness, of solitude (common in most travelers) in the three characters. I quickly made the decision that to explore loneliness, you explore the need for love. I’m attracted to internal characters and ideas. But it’s hard to explore internal characters and ideas in film, so I turned it into its positive, which, in turn, can be turned into action. I decided to explore love instead. Love/solitude – Journey/technology. This became the basis of my new film. The approach, then, became creating three characters that could sustain a film. I knew one thing: as a response to my first film, I wanted to do a film where you could “sit” with the characters for most of the time, where plot and any external device took a secondary position to the just being with the characters. I wanted to examine an intimate approach to the character, without needing to spend precious filmic time with anything else. From this approach and basic concept, all of the choices flowed pretty easily. What do you hope to get out of the festival, what are your own goals for the experience? I never set any particular goals to any film. For me the process of making the movie is intuitive and tactile. It must be a process of discovery. Otherwise, why show up everyday to the location and shoot. But from my director’s notes and script I knew what I wanted, which consisted of an exploration of those ideas. When I establish the visual “bible” of the film, I use every audio-visual influence within my grasp. Anything goes. It’s like going to a cafeteria and choosing anything that feels right. These include anything from photographs (a big influence in my work) to, of course, movies. You’d be surprised as to the titles. Let’s just say they were the least expected. Hopes and goals for the experience during the festival? Well, I hope people enjoy the film as much as I did when making it. I hope they recognize the solid work from the cast, which is what makes the film stand out for me. It’s all about the cast. 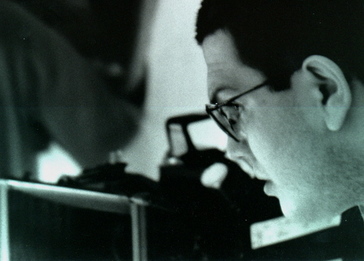 The financing of the film was a 2-year long period. In that period, we went through a bunch–and I mean a bunch–of producers, all of whom tried their best to get it done. My agent also helped a lot. The first thing we did is we got a cast interested and attached. From there, like I said above, my producer Steve Brown got involved and magically raised the money. I say “magically” because I honestly still don’t know how he did it. He just did and we were shooting. The casting happened as we were writing. I always get inspired by actors and find myself writing for them. I don’t necessarily mean writing for big-name actors or stars, but writing for actors I have worked in the past with, or that I have seen in films and plays. That happened to me with the role of Victor Rasuk (who I loved in “Raising Victor Vargas“), Marlene Forte (a great actress, who I had the pleasure of working with on the stage), Richard Petrocelli (I had worked with him in my student short) and Elizabeth Pena (no words of introduction are necessary). For the rest of the roles, I was extremely open. My agent set me up with several meeting with name and very good actresses for the role that Heather Graham eventually did. One of them was Heather. I immediately liked her energy and had this hunch about it. That’s how casting works. Your first impression is exactly what the camera will discover and show to the audience. This is why I pay very close attention to my impressions when meeting an actor/actress for the first time. One of the biggest challenges in making the film was the intense and quick shooting schedule we had. To make the movie you actually want to make requires a lot of preparation and time. Time is always an issue in independent films. I had made two films in such limited time in the past. I guess, it’s part of the trade by now. My definition of “independent film” is fairly open and, I guess, democratic. I think what defines an indie movie is and independence of vision by a director or his/her team. Unfortunately, in today’s marketplace, making these kinds of films means having a reduced budget as film companies are run like banks. One thing is clear to me: films made by a committee always feel like, well, films made by a committee. An indie film is the opposite of such abnormality. What are some of your favorite films, and why? What is your top ten list for 2006? Top 10 list of films I’ve seen this year: I’m afraid it’s not that big. I have a son and being a parent takes most of my time away. But the films I liked this year (and I can remember) are “Volver,” “Half Nelson,” “Accused” (a Danish film that is very good). What are one or two of your New Years resolutions? My New Year’s resolution: to make two more good films this year!